The Northwest's premier provider of metal coating services. Why Not Just Spray Paint? Pretreatment is the term applied to the process of preparing a surface to receive powder coat. It involves the stripping of any existing corrosion and the current paint or powder coating, the cleaning, degreasing and outgassing of the bare metal, and the creation of a surface finish adequate for a powder coat. There are several ways to pretreat metal. 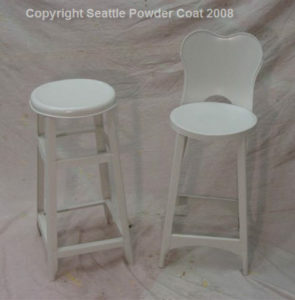 Here at Seattle Powder Coat we use chemical stripping and sand blasting. 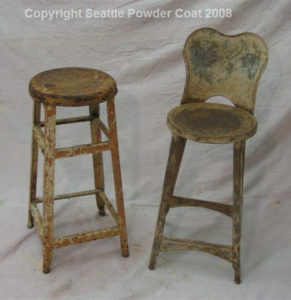 The objective of chemical stripping is to take the current coating off leaving the surface primed for sand blasting. This is not always needed and can be determined by whether the item in question is aluminum, powder coated currently, or is constructed in such a way that it would be difficult to remove the current coating using sand blasting alone. The objective of sand blasting is to leave a clean and slightly rough surface profile as an anchor pattern for the powder to adhere to. Some people refer to this profile as “tooth” because the coating bites into the metal to mechanically interlock the coating and substrate. The ideal anchor pattern to powder coat steel is created either mechanically (typically by abrasive blasting), or chemically (historically with a conversion coating). Abrasive blasting is the best way to remove old paint or rust, and is the only way to remove mill scale from new hot rolled steel. We consider abrasive blasting the only appropriate pretreatment for welded steel fabrications. However, abrasive blasting is labor intensive, can be expensive, and may not be well-suited for delicate parts. Powder can be sprayed over bare metal with no special pretreatment and initially look beautiful. Without proper pretreatment, however, the powder will chip and corrode easily. When shopping around for the right shop for you make sure to ask how they are pretreating so you have an idea of the longevity of your coating. Another form of pretreating not used at Seattle Powder Coat is called chemical conversion. These coatings are easily automated and inexpensive, but are environmentally harsh. Traditional conversion coatings include chromate zinc phosphate, or iron phosphates. Unfortunately, chrome, zinc, and phosphates are all environmentally damaging. The least damaging is iron phosphates, but powder manufacturers advise that iron phosphate by itself isn't recommended for exterior applications of steel. All conversion coating pretreatments are only as good as the maintenance of the chemical and the effectivity of the applicator. If the chemicals are not held within a narrow range of concentration and pH (typically requiring adjustment 1-3 times a day through a process called titration), the resulting pretreatment can be worse than no pretreatment. Manual wand iron phosphate pretreatment is so prone to problems that powder manufacturers often won't extend warranties to shops using only that method. Pretreatment is very important, complex, and difficult to evaluate after powder coat is applied. Where does that leave those looking for a powder coat service provider? Asking questions, looking at online reviews, talking with references, and researching the subject can provide you with background information that will help you formulate an opinion about the capabilities of a prospective coater. Ultimately you should visit the shop. We at Seattle Powder Coat take pride in having the equipment, permits, and process knowledge to properly pretreat virtually any coatable metal, and we work hard to maintain our reputation for high quality, durable, and long lasting powder coatings! NEXT: Why Not Just Spray Paint?